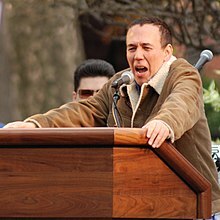 Gilbert Gottfried (born February 28, 1955) is an American stand-up comedian, actor, voice actor, and comedian. He was the voice of Iago in the movie Aladdin and the TV show based on the first movie. He was originally the voice of the Aflac Duck, but he was dismissed on March 14, 2011 and he was replaced by Daniel McKeague on April 26, 2011. Gottfried was born and raised in Brooklyn, New York on February 28, 1955, the youngest of 3 kids. ↑ "Gilbert Gottfried. New York Times". ↑ "Gilbert Gottfried: Biography, Latest News & Videos". This page was last changed on 31 August 2017, at 02:26.